Nothing says "Neotropics" like Toucans. Yes, the New World tropics have impressive macaws but there are gaudy parrots elsewhere in the world; yes, there are glamorous hummingbirds, but hummers are also found in temperate North America forest; yes, there are other groups endemic to the Neotropics (antbirds, ovenbirds, tapaculos, gnateaters), but none are universally recognized by the man (or woman) on the street. Everyone knows — and everyone loves — toucans. And toucans exist only in the New World tropics. Maybe the best-known toucan is Toco Toucan (left), from Fruit Loops cereal to the "Enchanted Tiki Room" at Disneyland. It is the "classic" toucan. And if you love one of them, imagine an entire tree-full ! (below). It is the big Ramphastos toucans, like Keel-billed Toucan (right, in a classic shot by Cagan Sekercioglu), that mold the public image of this family. They have huge colorful bills. Short & Horne (2001) even use the word "Rainbow-billed Toucan" for this taxa. 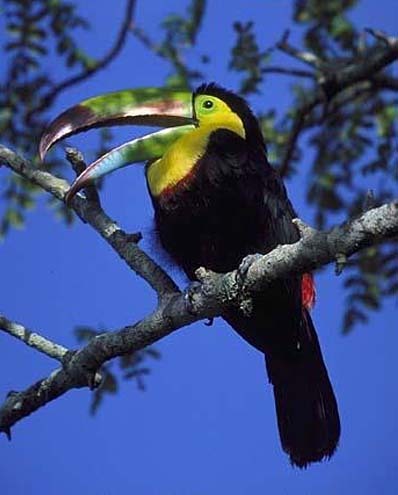 Keel-billed Toucan ranges widely in the lowlands from south Mexico to northern South America. 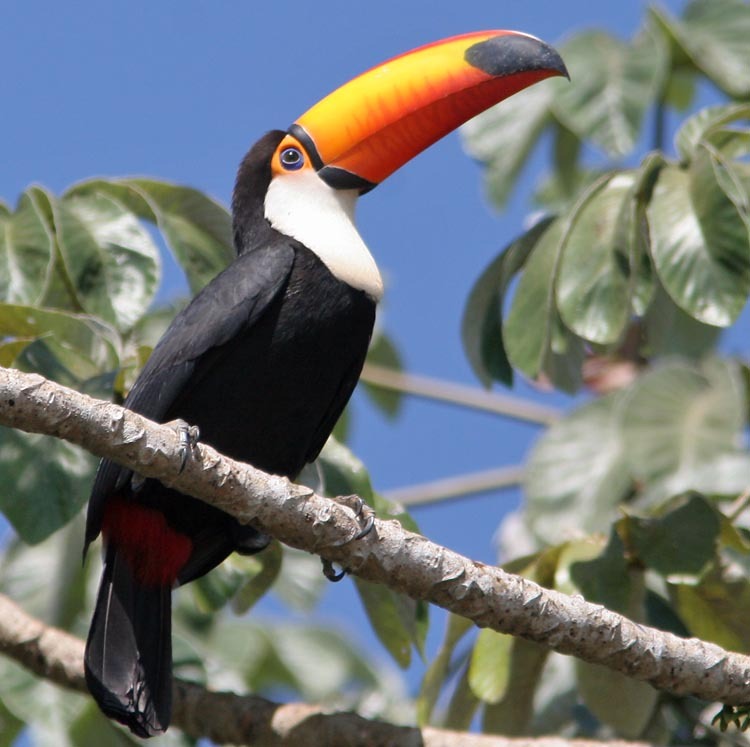 Toco Toucan is also in this genus, and has a wide range in South American lowlands, such as the Brazilian Pantanal, where one can spot the Toco sitting in the canopy of a lone tree from some distance away. It is the only species of toucan adapted to non-forested habitats. The toucan's huge bill is a very lightweight keratin, and is often used for plucking and swallowing fruit. Most toucans are primarily fruit eaters (Remsen et al. 1993), although though there are exceptions. Toco Toucan indulges in much more than fruit. We once watched it grab a nestling from an oropendula nest and fly off to consume it. Remsen et al. (1993) found that the stomach contents of this species was quite variable, with 44% "fruit-only" and another 44% with mixed arthropods and fruit. Molecular evidence has proven that New World barbets, toucans, and the toucan-barbets are more closely related to each other than they are to Old World barbets (Burton 1984, Prum 1988, Sibley and Ahlquist 1990, Lanyon & Hall 1994, Barker & Lanyon 2000, Johansson et al. 2001, Johansson & Ericson 2003, Moyle 2004). Given the evidence that toucans are actually 'big-billed New World barbets' when compared to barbets in the Old World, the modern approach, now adopted by the most authorities, is to treat the two groups of Old Word barbets as two separate families, Asian Barbets [Megalaimidae] and African Barbets [Lybiidae], and separate the three New World groups into separate families as well: New World Barbets [Capitonidae], Toucan-Barbets [Semnornithidae] and Toucans [Ramphastidae]. Although Ramphastos toucans are impressive, I prefer some of the smaller araçaris and toucanets. One of my absolute favorites is Curl-crested Araçari (left in a stunning shot by Arthur Grosset). The rich burgundy and ivory contrasts are gorgeous, the long tail unexpected, and the little white "curls" on the crown a real topper. Rita and I lay on our backs in the middle of the Amazonian rainforest, lying on a tarp provided by Rio Cristalino Lodge, and staring up at the fruiting tree in the canopy some 100 feet above us. This is where our Curl-cresteds were feeding. 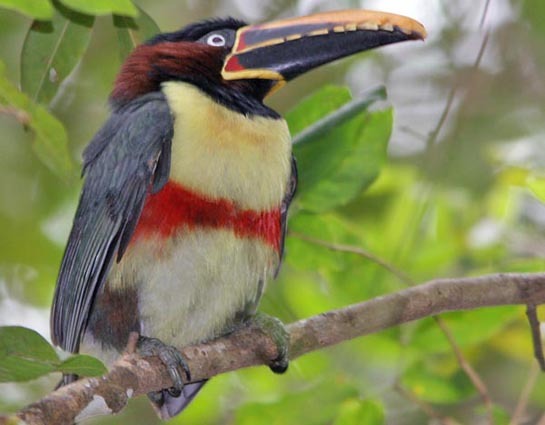 There are a dozen Pteroglossus araçaris, and among them are a wide array of green, yellow, black and red birds with various breastbands and differing bill patterns. They are not all easy to identify. This is Chestnut-eared Araçari (below), widespread in the Amazon Basin. There are some wonderful toucanets as well. This gorgeous bird (below) is Saffron Toucanet of south and eastern Brazil. It is easy to recognize a toucan but there are significant differences in the size of the birds, the size of the bills, and the shape and length of the tails among the six genera. Yet there is much disagreement as to how many species there are. Recent books have listed as few as 34 (Short & Horne 2001, 2002) to 41 (Sibley & Monroe 1990), or more. Short & Horne (2001, 2002) point to "massive hybridization" between "Cuvier's" R. t. cuvieri and White-throated Toucan R. tucanus, on one hand, and between "Yellow-ridged" R. c. culminatus, "Citron-throated" R. c. citreolaemus, and Channel-billed Toucan R. vitellinus, on another hand, supporting a conservative approach to speciation in these birds, as proposed some time ago by Haffer (1974). This conservative approach as so far generally been adopted by the South American Checklist Committee. This was all before Navarro et al. 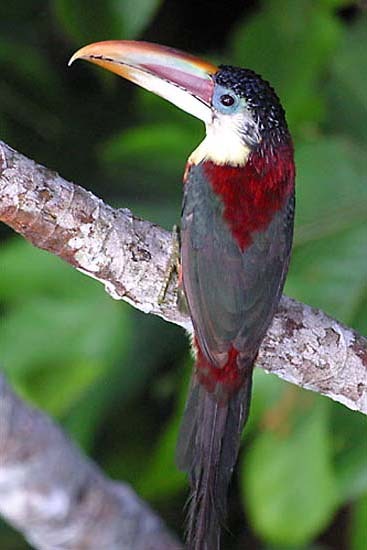 (2001) proposed splitting Emerald Toucanet into 7 species. Ridgely & Greenfield (2001) thought it might be an "oversimplification" to treat Emerald Toucanet as just one species. The subspecies lautus, albivitta, cyanolaemus, dimidiatus, and atrogularis, as well as Middle American wagleri and caeruleogularis, were formerly each considered separate species but Haffer (1974) treated them all as conspecific, and Short & Horne (2001) pointed out that the allopatric taxa are no more distinctive than those known to intergrade. Navarro et al. 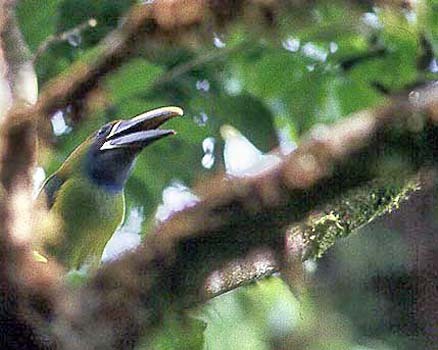 (2001), reviewing the morphology of the various populations, suggest that Emerald Toucanet could be split into seven species, but cautiously stated that "our studies ... led to more questions than they answered, and for that reason, the most appropriate conclusion to this contribution is to present topics that represent fruitful areas for further investigation." The calls were not diagnostic between populations, and their study did not include any molecular evidence. There is much yet to learn about toucan taxonomy. 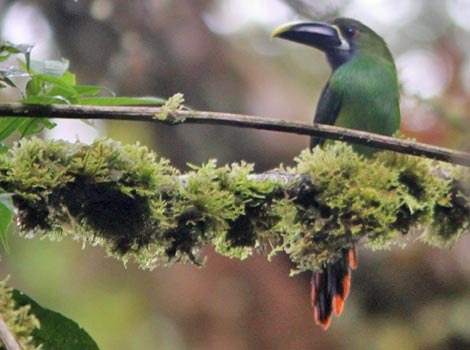 If they were to be split, the ones from Costa Rica to western Colombia (below left; photo by Marc Fenner) could become Blue-throated Toucanet while the ones in the Andes from southern Ecuador to Peru (below right) could become Black-throated Toucanet. Photos: The close-up of Toco Toucan Ramphastos toco was from the Brazilian Pantanal 20 July 2010; the 9-in-a-tree shot was taken in Emas NP, Brazil, on 26 July 2010. Cagan Sekercioglu photographed the Keel-billed Toucan Ramphastos sulfuratus in Rincon de la Vieja NP in northern Costa Rica in August 2000. Arthur Grosset photographed the Curl-crested Araçari Pteroglossus beauharnaesii at a fruiting tree at Rio Cristalino Lodge, Brazil, in 2003. The Chestnut-eared Araçari Pteroglossus b was in the Brazilian Pantanal on 19 July 2010. The Saffron Toucanet was at Itatiaia NP, southeast Brazil, on 3 Aug 2010. Marc Fenner photographed the Emerald (Blue-throated) Toucanet Aulacorhynchus (prasinus) caeruleogularis at Monteverde, Costa Rica in April 1990, and the Emerald (Black-throated) Toucanet A. (p.) atrogularis was at Owlet Lodge in northern Peru in Nov 2014. Photos © Cagan Sekercioglu, Arthur Grosset, Don Roberson, and Marc Fenner, as credited, used with permission, all rights reserved. Short, L.L., and J.F.M. Horne. 2001. 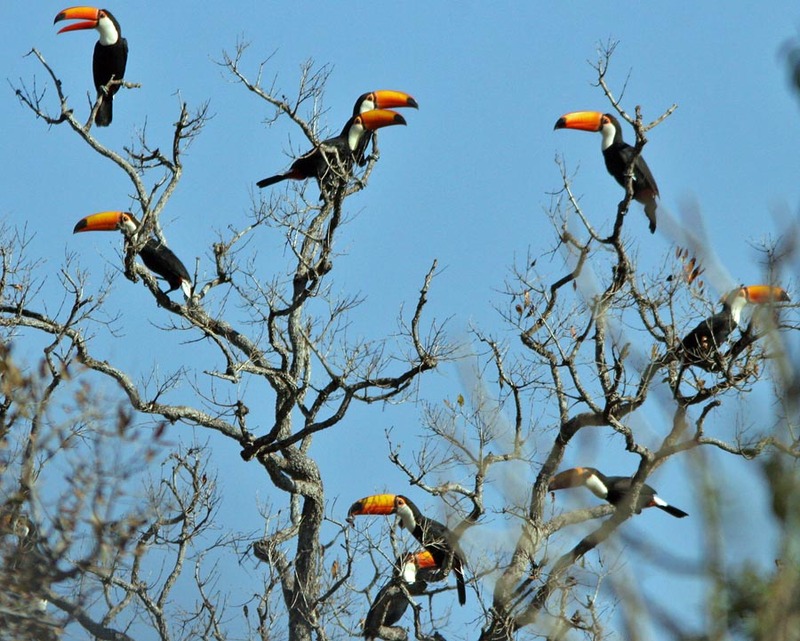 Toucans, Barbets, and Honeyguides. Oxford Univ. Press, Oxford. I confess that I don't actually own this book, nor have I done more that quickly glance through it in a bookstore. But every one of the Oxford Univ. Press series on bird families has been excellent, and this looks equally solid. I presume that the "meat" of this book has been summarized by the same authors in their Handbook of the Birds of the World series (Short & Horne 2002) which I do own and have studied. Consistent with Oxford books in this series, the introductory material is extensive and the species accounts thorough. Plates and illustrations more than adequately enhance the text. If I have any quibble, it is with the conservative approach to family level taxonomy but, then again, this was written before the molecular studies by Johansson et al. (2001) and Moyle (2004). American Ornithologists' Union. 1998. Check-List of North American Birds. 7th ed. A.O.U., Washington, D.C.
Barker, F.K., and S.M. Lanyon. 2000. The impact of parsimony weighting schemes on inferred relationships among toucans and Neotropical barbets (Aves: Piciformes). Mol. Phylog. Evol. 15: 215-234. Burton, P.J.K. 1984. Anatomy and evolution of the feeding apparatus in the avian orders Coraciiformes and Piciformes. Bull. Brit. Mus. (Natural History) 47: 331-441. Haffer, J. 1974. Avian speciation in tropical South America. Publ. Nuttall Ornithol. Club, no. 14. Johansson, U.S., and P. G.P. Ericson. 2003. Molecular support for a sister group relationship between Pici and Glabulae (Piciformes sensu Wetmore 1960). J. Avian Biology 34: 185-197. Lanyon, S.M., and J.G. Hall. 1994. Re-examination of barbet monophyly using mitochondrial-DNA sequence data. Auk 111: 389-397. Moyle, R.G. 2004. Phylogenetics of barbets (Aves: Piciformes) based on nuclear and mitochondrial DNA sequence data. Mol. Phylog. Evol. 30: 187-200. Prum, R.O. 1988. Phylogenetic interrelationships of the barbets (Aves: Capitonidae) and toucans (Aves: Ramphastidae) based on morphology with comparisons to DNA-DNA hybridization. Zool. J. Linnaean Soc. 92: 313-343. Remsen, J.V., Jr., M.A. Hyde, and A. Chapman. 1993. The diets of neotropical trogons, motmots, barbets and toucans. Condor 95: 178-192. Short, L.L., and J.F.M. Horne. 2002. Family Ramphastidae (Toucans), pp. 140-219 in Del Hoyo, J. Elliott, A., & Sargatal, J. eds. Handbook of the Birds of the World. Lynx Edicions, Barcelona. Sibley, C.G., and J.E. Ahlquist. 1990. Phylogeny and Classification of Birds of the World. Yale Univ. Press, New Haven, CT.